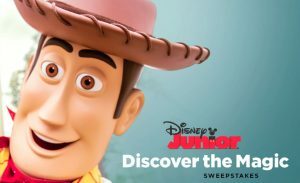 You could win a magical vacation from Disney Junior! The only thing more precious than watching your little ones chase a dream, is seeing them catch one. That’s why Disney Junior wants to send your family on a WALT DISNEY WORLD® Resort vacation. Here every moment is filled with a Magic so powerful, even the familiar feels brand new. Come Discover the kind of Magic you can only find at WALT DISNEY WORLD® Resort.